Well, I don't watch the Talk to begin with so boycotting won't be a problem for me. AWWWWW THAT'S SAD. POOR SHERYL. I think its horrible for her to act like one hair texture is better then the other.This is why people are the way they are nowadays because if we are not happy with whatsup we were blessed with then why should they be.Sad....I am 23 and natural and to see this it upsets me and now I wont watch or listen or anything to do with her.I don't want to hear about someone who is willing to degrade someone or something because your not happy with yourself. It's just one opinion of many, let's not let others define us. I see many "jokes" about naturals on other social media sites as well! But, hey, I love/embrace my natural hair... Knowing that everyone doesn't, and I'm ok with that. #blackpowerpowerisforblackwomen when Underwood slams black afro hair as ugly. When black mothers like her wear weaves and teach their daughters to hate their god given hair. Sad sad sad. Well I'm speechless I didn't think at that age and in these times people were still this ignorant. This is the same thing that happens when natural ladies talk about are look side ways a women who still get relaxers or women who are natural and. Choose to get blow outs. We ALL have opinions, I guess. Some African American with Afro have due to losing there hair to breast cancer , So I don't care what she says I love my natural. May she need to wipe some of that ugly off her face and see the beauty in Natural hair, I want be watching the show any more or listening to her on Steve Harvey. I don't watch this show that much anyway. Whenever I've attempted to watch it she' always acting like a minstrel in my opinion, and I change the channel. 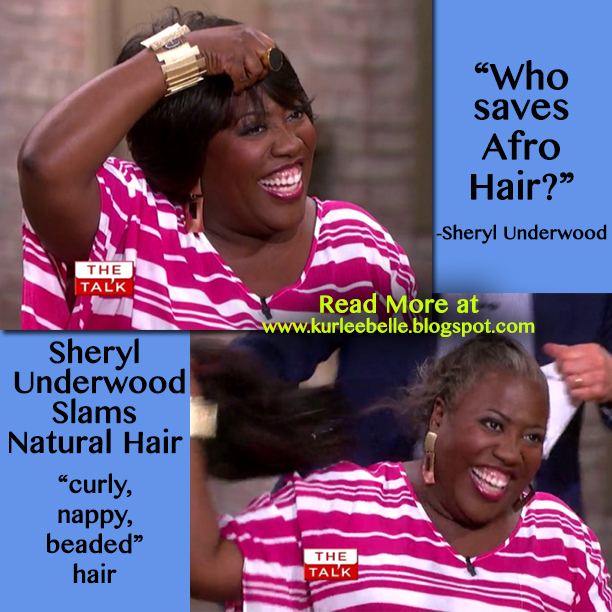 Sheryl is ignorant of her true hair self,she really made some very stupid comments. She is not that funny anyway. Sheryl is ignorant of her true hair self. She made some really stupid and inappropriate comments. OAN.... She is not that funny anyway!